New York City. Rick Ross’ new Rather You Than Me helped me pass the time as I walked by Junior’s Cheesecake and Radio City Music Hall. Dave Chappelle was the only thing on my mind. He was my reason for making the trip from the nation’s capital. The second time in a month I was set to experience the genius in an intimate setting. Chappelle is comedy’s own Jim Brown — or Barry Sanders. He walked away from the game at the peak of his powers. I was thinking about the premature deaths of Robin Harris, Patrice O’Neal and Chris Farley. Wondered what would happen if Katt Williams got out of his own way. I wondered: Does Dave still have it? Did Dave Chappelle even still care? The “turned down” he was referring to is, of course, his abrupt 2006 departure from Comedy Central and his unparalleled sketch program, Chappelle’s Show (2003-06). Chappelle reportedly walked off the set months after signing the mammoth deal for the show’s third and fourth seasons, citing “manipulation by people around him.” To the public, back then, it seemed like Chappelle just disappeared. In the years since, urban legend had him showing up, impromptu, at Bay Area venues. These stories were repeated like tales of spotting B.B. King or Miles Davis in smoke-filled, dimly lit jazz joints. Or seeing James Baldwin in a Paris cafe, penning the stories of his life. Dave Chappelle performs onstage at the Hollywood Palladium on March 25, 2016 in Los Angeles, California. The “$60 million” was a not-so-subtle homage to the deal he inked with Netflix last November. The announcement followed Chris Rock’s $40 million deal (also with Netflix), and was on the heels of his record-breaking Saturday Night Live hosting debut (A Tribe Called Quest was the musical guest) just days after the election of Donald Trump as president (the monologue is here). Chappelle’s Netflix contract guarantees three comedy specials in 2017. Two — The Age of Spin, filmed at the Hollywood Palladium and Deep in the Heart of Texas, set at Austin City Limits — are set to arrive Tuesday. I was on my way to an early look. Let’s keep it a buck. Chappelle is still funny. 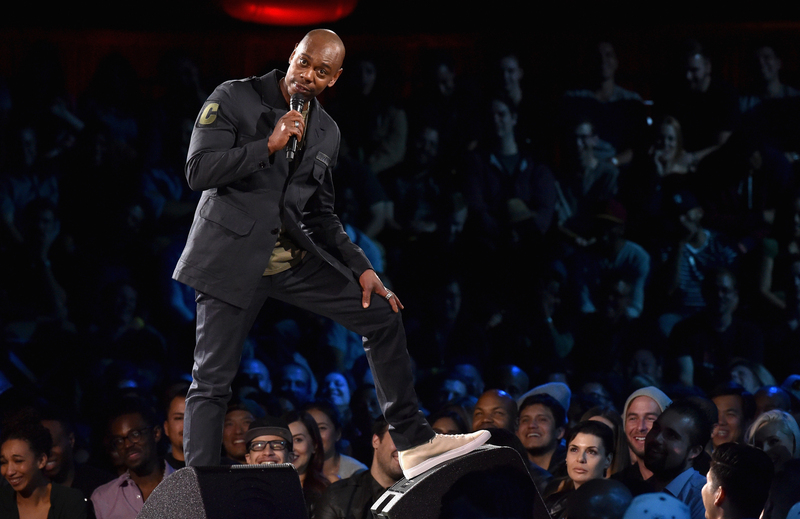 These two new Netflix specials are Chappelle’s first formally filmed stand-up performances in over a decade, since 2004’s For What It’s Worth. And he doesn’t disappoint. Movies — 1993’s Robin Hood: Men In Tights, 1996’s The Nutty Professor and the 1998 stoner classic Half Baked — introduced us to Chappelle. The aforementioned Chappelle’s Show solidified his place in comedic history with names such as Pryor, Murphy, Carlin, Gregory, Williams, Foxx, Rock and, yes, Cosby. Race is a constant in both The Age of Spin and Deep in the Heart of Texas — the sun in Chappelle’s comedic solar system. For three decades now, the gravitational pull of his views on racism, sexism and bigotry have morphed crowds of fans into cult-like congregations, and comedic bits into mandatory gospels. The Age of Spin is Chappelle’s interpretation of how the world processes information — or doesn’t. It’s Chappelle’s view of the world, how he fits in, and why he chooses to stand out. Deep in the Heart of Texas, conversely, is extremely intimate. It’s about Chappelle’s life on the road, and more hilariously, his life at home. Chappelle the comedian is hilarious. But Chappelle the husband, father and friend, is endearing. Pieces of ourselves radiate off the screen as the comedian revels in his own shortcomings. In both specials, Chappelle’s comedic honesty is funny, even as he addresses topics such as police brutality, Ray Rice, his four separate encounters meeting O.J. Simpson, his relationship with his black fans, Flint, Michigan’s, water crisis, diarrhea, masturbation etiquette (by far one of the funniest moments in either film), the struggles various ethnic groups face compared with African-Americans and, perhaps most fascinating, LGBT rights. The latter is noteworthy because Chappelle is firmly for equal rights for all groups. He says as much. But even at north of 40 years old, Chappelle is attempting to understand and completely embrace the complexities of LGBT communities. Vulnerable moments like these shine bright. Especially as Chappelle’s comedy moonlights as truth-telling in an era punch-drunk on division and racial strife. His ability to illuminate and interrogate agonizing and poignant topics hasn’t left him in the 11 years since he walked away from Chappelle’s Show. He’s a true descendent of Richard Pryor, willing and brilliantly able to explore “black” topics in mixed company. You laugh even when you believe he crosses the line, especially when he crosses the line. In a world where alternative facts dictate America’s climate and blind accusations dominate news cycles, life needs Chappelle’s honesty. Comedy, much like music, is a survival tool in 2017. The trek back to Penn Station seemed like the quickest two-mile walk of my life. I didn’t care about sheets of snow falling from New York City skyscrapers or that I basically sacrificed my LeBron 10s to street slush. I couldn’t stop laughing. Because Chappelle had done it again. His shot at Key and Peele. Deciding the fate of four white kids who “assaulted” him with a snowball. His dissertation around the word “p—y.” Bruce and Caitlyn Jenner. Bill Cosby and the more than 50 allegations of sexual assault levied against him. His homage to Kevin Hart. Why the LGBT community should use the landmark 1954 Brown v. Board of Education as its protest barometer. Calling this Chappelle’s “comeback” is unfair. Technically, he never left. “He said in a GQ article,” Joco said, “if D’Angelo’s making hot songs, just because he doesn’t release [them], doesn’t mean he’s not D’Angelo.” Unlike the famed reclusive singer — who also took an extended break from his own craft — Chappelle’s not dubbing himself a “black messiah.” This is the guy who can’t stop eating his kids’ lunches after he gets high. This is Dave Chappelle with a mic in his hand. What could possibly go wrong? What more could you possibly want?